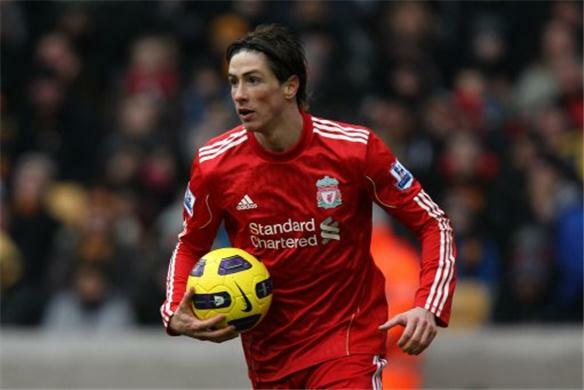 English Premier League club Liverpool have rejected the transfer request handed in by their ace marksman Fernando Torres. “Fernando Torres on Friday submitted a written transfer request, which has been rejected by Liverpool. "Fernando is under long-term contract and the Club expect him to honour the commitment he made to Liverpool FC and its supporters when he signed the agreement," read the official statement from Liverpool. There had been plenty of speculation in recent days about the departure of the 26-year-old from Anfield. Premier League Champions Chelsea had made a bid worth 35 million pounds for the Spaniard which was rejected by Liverpool. There was a sense of jubilation at Anfield when they secured the services of Uruguay front-man Luis Suarez from Ajax. However, the news was put on the backburner after Torres dropped the bomb of handing in the transfer request. Liverpool were hoping that the news of Suarez’s buy would convince Torres that the club is ambitious, and it would force him to stay at the club. However, it seems as though Torres had already made the decision, and was being lured in by the big money offer made by Chelsea. Fernando has a contract running at Liverpool that runs till the end of 2013 season. This is not the first time Chelsea have tried to buy Fernando Torres. The London club had earlier made an effort to bring the Spaniard to Stamford Bridge last summer and also made a bid in May. Back in August, Fernando Torres ended all speculation about his future at Liverpool (or lack thereof). The front-man made a statement saying: "My commitment and loyalty to the club and to the fans is the same as it was on my first day when I signed. "I am looking forward to the challenge ahead." Liverpool have reminded Fernando of these comments and said that they have no intention of letting him go. The timing of Torres’ request is also not ideal as there are just couple of days left before the transfer window closes. Fernando has been their leading scorer in the last 3 seasons, and it is imperative for the Reds to keep hold of him. Liverpool have made it clear that even if Chelsea come back with an improved bid, they would not entertain them. Fernando Torres has been plagued with various injuries this season, and in 26 appearances has only managed to knock in 9 goals. If Liverpool fails to make it to the Champions League, it would make the chances of Torres leaving even stronger. Now it is to be seen that how long are Liverpool able to keep hold of their player. Reportedly, there is a clause in Fernando Torres’s contract that at the end of the current season if Liverpool do not manage to get into the Champions League, and a club makes a bid worth 50 million pounds, Liverpool would have no option but to sell him. Chelsea would be mindful of that fact and may wait for the summers if they are not successful in getting their man in the winter transfer window.